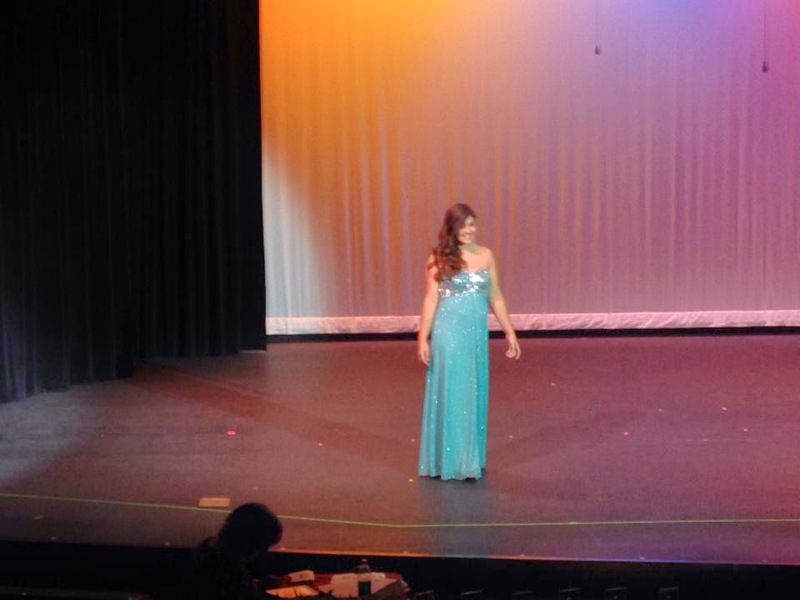 I don't think I'll ever know how I feel about beauty pageants. Part of me can't believe we haven't come further in society than to parade young women across a stage and compare and compete based on beauty. Someone please tell me we no longer do this. And fierce competition it can be, too. I know, because I interviewed Miss South Carolina and told her story that got her there and on to the Miss America pageant in a magazine cover story. But part of beauty pageants is community service, learning to be an articulate communicator, and interviewing skills and experience. Part of it a young woman's accomplishment, intellect, and talent on display. I'm all for honoring and celebrating hard work. In a day and age when the sexes are blurred and homosexuality is the new black, I like that my daughter was holed up in her bedroom this afternoon with two best friends putting curls in Reagan's hair, eye liner just so, and unwrapping new earrings for the occasion. I like that she studied her interview questions and answers late into the night with her older sister who would have rather been asleep but stayed up to help Reagan. That will be a worthwhile sister memory. And the twenty minute rides to and from the school — all 5 of them in the last 48 hours — have been full of singing Broadway songs with my girl at the top of our lungs, and short, casual conversations about the balance between competition and having fun that really weren't all that casual after all. I told her I was proud of her for doing everything herself. No mom taking over, telling her she ought to wear a suit for the interview. It was all Reagan, every choice, every preparation. No paid make up artist or hair style. Just a girl and her friends in her room. Part of me will be squirming tonight when my growing up girl walks gracefully across the stage in her teal gown. But part of me will be very proud, and when it's all said and done tonight, I still won't know how I feel about pageants. I've worked out many times and many ways, but today I had a first date with Pilates. I've committed to 90 days of P90X3 to prove to myself I can indeed do this for life. Twenty-five days down, 65 to go. Or, the first day of the rest of my life, depending on how you look at it. Day 25 is the introduction to a new routine: Pilates. The breathing felt a bit foolish and brought back memories of birthing classes. Because many, many moons ago, I was delivered of three babies. They brought me unadulterated joy and totally wrecked my core. Actually, it's not entirely fair to blame it all on three babies. The gate that might have killed me is to blame as well. I was delivered from it too, and my parting gifts were a fractured pelvis and exploratory abdominal surgery which guaranteed youthful, taut ab muscles would be a thing of the past at the tender age of 11. I am not overstating, either, because I was so weak, my lower back ached for the rest of the day after I vacuumed the house. In high school. Anyway, when Joseph Pilates came through his own mother's birth canal, I think he was taking notes for the future creation of his exercise discipline that might repair all that he he wrecked when he grew inside his mother. That's what it felt like anyway. Like repair. Like a hint of the beginning of a second chance at the old me, the one who at least had a little pre-pregnancy core strength after the gate and the doctors got through with me. I could feel places in me that are weak getting strong. Not a dramatic Rocky-theme-song kind of strong, but a subtle, nuanced kind of strength that rises so slowly you don't realize it's coming until it's right there in the room with you keeping you company while you Shh, Shh, Shh until you think you might hyperventilate. It's the kind of strength that keeps you from looking and feeling foolish when you look and feel foolish. Another thing I loved? Tony Horton — who is Mr. Fitness himself — got on the floor and did the move he called the pretzel. His attempt was not pretty, and he poked a little fun at himself while he was doing it. But he did it. He put it on the video and in America's hands, his weakest move that showed him in the poorest light. He rolled his eyes and smiled silly faces at himself, knowing he looked less than stellar. He mumbled something about being better at pull ups, but he didn't quit. He said, "This must be good for me," with a hint of sarcasm in his voice. The whole thing made me feel like a winner. Pilates. Tony-Mr. Fitness-Horton secure enough in his fitness prowess to show his weakness and humbly know it wouldn't wreck his credibility as a trainer. The inspiration of humanity on display. Twenty-five consecutive days, a glimpse at a second chance, and knowing there's always the rest of your life. They are all good, good reasons to keep going in the same direction slowly. I learned today that the number one reason to be admitted to an assisted living facility is no longer being able to sit and stand unaided. Well, no thank you. I choose strength and balance and flexibility and aging with poise and grace. The winner of Spiritual Misfit is Glenda Childers. Congratulations, Glenda. I hope you enjoy this book as much as I have. With Easter weekend upon us, I ponder anew his gift to us on the cross. It stills my soul and quiets my mind. I am so in awe, I don't know what to feel. I asked my preschool Sunday school class, "Who puts band aids on your elbows and kisses the hurts away when you fall down?" Most of them raised their hands into the air about to burst at the seams with the answer. When I smiled Addy's way, she proudly exhaled, "Jesus!" Have you been a Christian long enough to know the Sunday school answer? Everyone knows Jesus is the answer and everything else is wrong. Everyone, that is, except Michelle DeRusha. This girl says what no respectable Christian would about her faith in Spiritual Misfit: A Memoir of Uneasy Faith. Finally, there is someone brave enough to say all the things we Christians have thought then promptly suppressed, thinking them inappropriate. Michelle says it all and confesses it loud. She's no stranger to confession, and she's found it much more freeing and absolving to shout her shortcomings and flaws, her mistakes and misgivings, her timid baby steps toward God and her skepticism to the whole word rather than whisper them shamefully behind the veil of the confessional. She stares her uneasy, fragile faith in the eye. 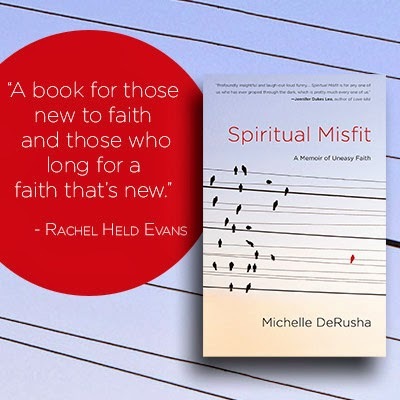 With an equally scant measure of defiance pitted against her paltry faith, Michelle plods on in her awkward and jolting relationship to God. She's determined to hammer out her Christianity no matter what it looks like, even if she misses and hits her thumb — or worse, God's — in the process. If you are one who learned long ago to sensor your answers and substitute them with the Sunday school answer, whether it's the truth — your truth — or not, meet Michelle, the girl with your story, give or take a few details. You will love her instantly because you will see yourself in her, and you will cheer her forward in her faith. She’s the underdog, and aren't we all suckers for the underdog? Maybe if we as Christians were more honest about our messy faith, those still searching for their faith would see themselves in us, see an underdog and a God who loves us all in spite of the mis-fit and the fall-short. I've always thought I wanted others to see Jesus in me. I still do. But after reading Michelle’s book, I also want people to see the flawed and beautiful battle of dying to myself and groping my way in the darkness by faith to a very real God who loves me anyway. It's comforting to know we are not alone in this, especially when our real life faith often doesn’t look like the Sunday school answer. Maybe you haven't yet embarked on Michelle's journey. 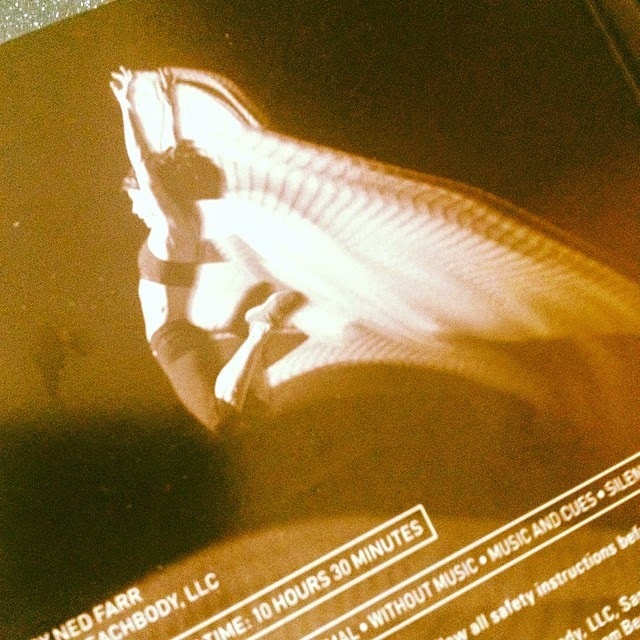 You haven't found the courage to hold your feeble and fragile faith-baby still gestating inside you. If that’s you, you’ll find in Michelle's story the courage you've been searching for. Her experience is flawed and human and wanting and very, very real. You will find yourself in her words. You could win a free copy of Michelle’s book. I’m giving away Spiritual Misfit to one brave commenter. 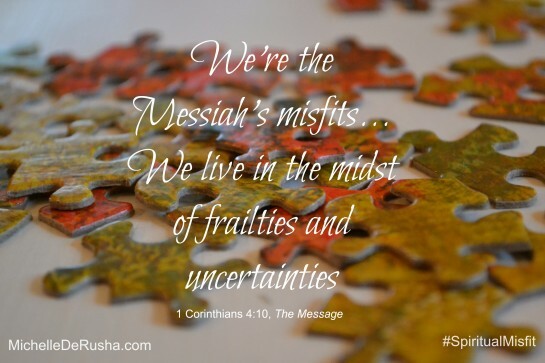 So, tell me, what makes you feel like a spiritual misfit? I’d love to hear from you in the comments. Let’s be brave and talk about it. I’ll be right there with you to say, “Yeah. Me, too.” Or you can just tell me why you'd love to read this book. Any comment will do. 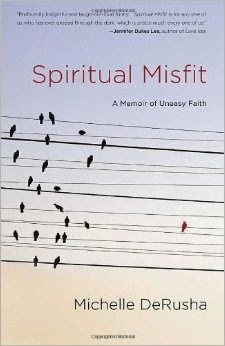 You can also find Spiritual Misfit on your local bookstore shelf starting today or order online from Amazon, Barnes & Noble or ChristianBook.com. 1. Enter to win by leaving a blog comment with a way to contact you in case you win. 2. Entries close Thursday afternoon at 5PM EDT. 3. I’ll announce the winner on the blog on Friday. 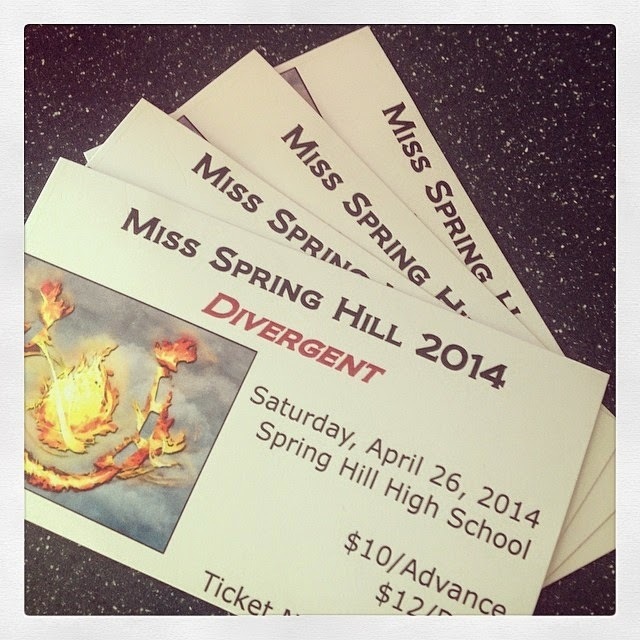 Why Do We Still Have Beauty Pageants Anyway?